The digital TrunkTracker V is the first full handheld unit that requires no user programming. Simply turn it on, enter your zip code and TrunkTracker V does the rest. The user friendly digital scanner will immediately begin hearing communications systems used by Public Safety, Aircraft, Military, Weather Spotters, and more. This functionality is made possible by combining the rich radio system database from Radio Reference with Uniden's patented radio system selection methods to correctly identify and monitor only nearby systems in the USA/Canada. Whether it is across town or across the street, the BCD436HP keeps you informed. Now with the largest display on the market and more advanced features the BCD436HP makes a superior unit for a scanner enthusiast Features: Simple. 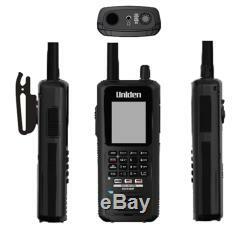 Uniden BCD436HP P-25 PHASE I & II TDMA Handheld Digital Police Scanner NEW! Now with the largest display on the market and more advanced features the BCD436HP makes a superior unit for a scanner enthusiast. Simply enter your zip code or city, and the BCD436HP selects the channels in use in your area. The built-in database includes all known channels in use in the United States and Canada. (All services not available in some areas). Lets you simply update the BC4536HPs database and firmware, easily manage favorites lists, and edit other settings in your scanner. Allows you to specify the area that you need to hear any alerts that may be Weather, Civil, Biological, Nuclear, or National in nature. (Analog, Motorola, EDACS, LTR Trunking, APCO 25 Phase 1 and X2-TDMA Phase ll Digital). Lets you monitor all of the major types of communications systems used by public safety, local government, amateur radio operators, and more. TrunkTracker V APCO 25 Phase I and Phase II X2-TDMA Motorola, EDACS, and LTR Trunking. Zip Code Selection for easy setup. Temporary Avoid Location-based scanning Fire Tone-Out Alert. 8-hours operation on 3 "AA" batteries. 3 X AA NIMH Rechargeable Batteries. As with any electronic item, additional installation parts may be required to complete installation. We have been in the Consumer Electronics business for over 15 years and know what it takes to please our customers. We strongly encourage professional installation of any electronic devices. We are not responsible for any damage caused by improper installation. We are not responsible for any damage caused by defective products or loss of use, uninstall/reinstall charges that may be incurred due to defective products. By purchasing your product from us you agree to these terms and conditions with NO exceptions. We do not allow local pick-ups or drop-offs. No third party billing offered. Our warehouse is open Monday through Friday. We cannot be held responsible or liable for typographical errors, inaccurate specifications, features or terms used in our listings. All of the products that we offer are factory sealed, brand new and never opened. The item "Uniden BCD436HP P-25 PHASE I & II TDMA Handheld Digital Police Scanner NEW" is in sale since Sunday, August 5, 2018. This item is in the category "Consumer Electronics\Radio Communication\Scanners". The seller is "centralbuys" and is located in Grand Rapids, Michigan. This item can be shipped to United States, Canada, United Kingdom, Denmark, Romania, Slovakia, Bulgaria, Czech republic, Finland, Hungary, Latvia, Lithuania, Malta, Estonia, Australia, Greece, Portugal, Cyprus, Slovenia, Japan, China, Sweden, South Korea, Indonesia, Taiwan, South africa, Thailand, Belgium, France, Hong Kong, Ireland, Netherlands, Poland, Spain, Italy, Germany, Austria, Israel, Mexico, New Zealand, Philippines, Singapore, Switzerland, Norway, Saudi arabia, United arab emirates, Qatar, Kuwait, Bahrain, Croatia, Brazil, Chile, Colombia, Costa rica, Panama, Trinidad and tobago, Guatemala, Honduras, Jamaica. California Prop 65 Warning: This product can expose you to chemicals including lead, which is known to the State of California to cause cancer and birth defects or other reproductive harm.